Digging in the archives here at 1967beetle.com, we wanted to put this fantastic article in the spotlight once again. A huge thanks to Jay Salser for his edits, etc. Tell us about the history of your ’67 Beetle. 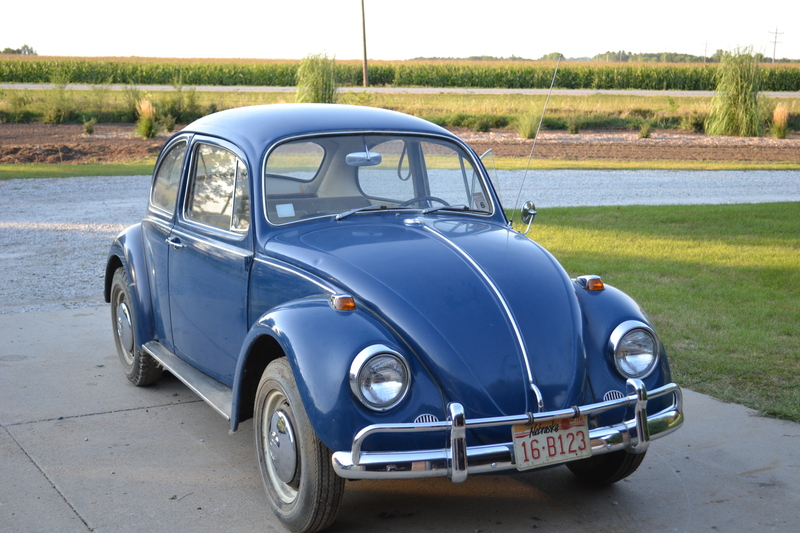 My great-grandfather purchased a used 1967 Volkswagen Beetle, painted Volkswagen Blue, in November of 1967 (it was built in August of ’66 so I’m assuming that the previous owner had it for about a year). He drove it a fair amount until his death, when my grandfather inherited the car. It ended up at my grandparents’ house, and when my dad was in high school it was really never used (although it still wears the dents he made with a golf ball). When my dad went to college, however, he ended up driving it sometimes, because it was economical and he wasn’t too concerned about anyone breaking into it. Although my dad never hated the car, it just really wasn’t for him. As a result, in late 1986, it was put into the garage at my grandparents’ house. Aside from being rolled from one garage stall to another in the late 1990s, it was absolutely untouched, complete with a half tank of gas (yikes!) and the battery still connected. Over time, it was filled and covered with all sorts of things—used as an impromptu rack and an occasional cat toy. Growing up I always knew about the car (we live next door to my grandparents), but I never really thought much about it. Around the time I was a junior in high school, however, I started to see dollar signs as I thought that maybe I could sell it and make a little money. I knew zero about cars so that began to fizzle. Right before senior year, a friend who likes cars started asking about it. We decided to start working on it, working sometimes only once or twice a month. 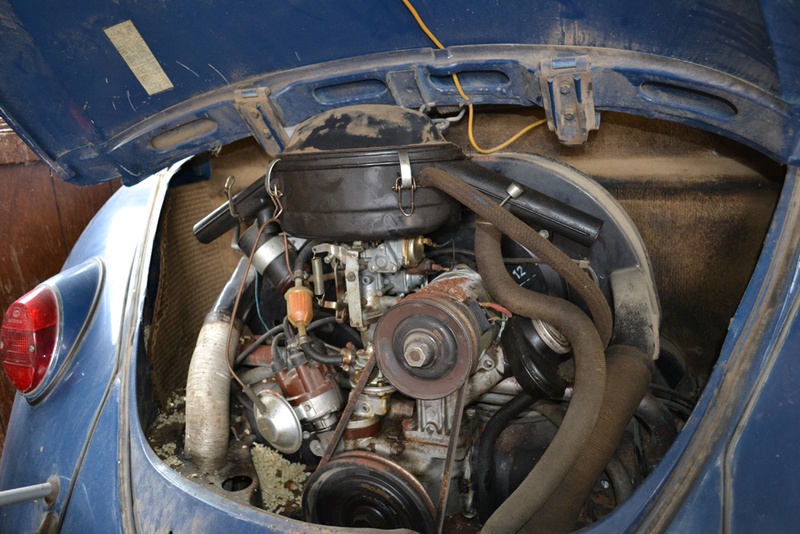 Our goal was to get it started, because we knew that a running car is worth a little extra. We replaced fuel lines, got a new fuel pump, replaced spark plugs and the ignition coil, among other things, experiencing our fair share of misadventure along the way. I remember that every time we made a little change, we would sit there cranking it, praying that it might cough to life. Finally, in November, we had just replaced the ignition coil and I popped into the driver’s seat and turned the key. Instantly, it roared to life. Although there was still a lot of work to be done to make it road worthy, I knew at that moment that I could never sell the car. That day we made it up to a roaring 5 mph (the carburetor was in desperate need of a rebuild). In the months that followed, we got new tires, replaced the master cylinder and each wheel cylinder, rebuilt the carburetor, and performed other minor maintenance. Now I’m a freshman in college and the ‘67 has become my daily driver. It’s so cool to think that 30 years ago my dad was on this same campus with this very car. For the most part everything is completely original (and rust free! ), aside from slightly larger tailpipes, a new radio (that was built to look like a period correct Volkswagen radio), speakers, and other very small items. Paint and interior, while not perfect, are 100% original. I started the process in August, 2011, as a busy high school senior with zero mechanical experience. Because of commitments to school, sports, etc., it was a slow process that wrapped up in May, 2012. We would sometimes be able to work only one weekend a month, so we made them count. It wasn’t a full restoration, either. The car was in good enough shape that it was more a process of making it totally roadworthy, able to be enjoyed daily both in town and on the highway. My hope is to perform a full restoration when I am out of college and on my own. Not knowing anything about how cars work was a massive setback. Not only did it impact my understanding of what could be causing the car not to run, but it also made me worried that I might do too much to the car and accidently mess something up. I had to use a lot of resources and look to people who had worked with Beetles, in order to make sure that everything was tip top. A local shop that specializes in vintage Volkswagens was my biggest ally. Since I was without a car lift or many automotive tools, they were a great place that could do those few things not possible in my garage. They also were helpful in talking me through more challenging processes and helping to find parts. It was not necessarily planned that the car would sit for a quarter of a century, and as a result it wasn’t prepped in any way. The fuel tank was nearly half full of ‘80s gas, and that had not been kind to most of the fuel system. We actually had an incident where the rubber fuel line that runs from the tank to the metal fuel line cracked open while we were working. Oblivious to this, we rolled it inside and called it a night. Soon, the garage floor was covered with a black mess. I’m just thankful that the car was garaged as long as it was. I have been told multiple times that my Bug has one of the most solid original frames/pans anyone has ever seen, and I plan to do everything I can to keep it that way. Another large challenge was that mice had made the car their home. I found large nests in both the engine compartment and the front trunk area, and the headliner had been chewed through in a few places. I was very concerned about how the electrical components/wiring had fared, but in the end we lucked-out. I have yet to find any sign of rodent damage to these important components, and everything on the car works as it should. Besides these things, we never were blindsided. Sure there were nuts and bolts that seemed impossible to loosen, but that’s all in the fun of the process. When we first had it running, we had one of the brake cylinders apart because it was locked up. I couldn’t stand waiting until I had the time to replace it, so we spent a lot of time slowly and carefully trekking up and down the driveway, allowing it to slow to a stop or augmenting it carefully with the emergency brake (we were very careful not to damage or over work the e-brake). This was my first manual shift car (I’ll never go back to automatic! ), and because I learned how to drive it without working brakes, it was weird to drive when first we had those repaired. I have never driven a Beetle with the 6 volt system, but it’s clear what an impact the 12 volts really has. This thing is so reliable. I have had zero issues getting it started. Everyone mentions this but it’s so true– you have the “classic” styling with more power and generally improved technology. I am able to easily and safely keep up with traffic, and I still turn heads everywhere. I also simply like the fact that there were so many “one-year-only” parts on this car. It’s easy for the many model-years to blur together, but the 1967 year stands out. It’s all in the little details. I love the things such as the little reverse lights on the back bumper. Thankfully, almost everything was in great or at least completely useable condition. For the small things that needed to be replaced, there were plenty of WebSites with what I needed. The hardest part was that there are so many 1967 specific parts that it can be difficult to find exact replacements. For example, the tank that holds washer fluid on my Bug has a tiny hairline crack that leaks only when the tank is pressurized. I tried the ugly epoxy fix, but even that couldn’t contain the pressurized stream. Unfortunately, no one manufactures the tank anymore. There are usually a few on eBay, but not all are in good condition. It’s one of those things where you have to keep an eye out for the right item at the right price. What is your take on doing a 100% stock restoration vs non-stock? I really like to keep things as close to original as possible, if the car is in decent shape; or at least only make changes that don’t detract from the originality. For me, a decent sound system was important, but I used components that fit with the car and retained the vintage look. I also needed to replace my tailpipes. I opted for slightly larger ones that have an angled tip. They add a slightly deepened tone and look sharp, but don’t take away from the vintage appearance. Plus, things like tailpipes are very easy to swap out, so it really doesn’t bother me. The thing that I am generally not a fan of is altering the car permanently. These already are unique vehicles, and you can never go back from a permanent change. If you are adding a huge engine to a Bug, it seems to me that you would be better off spending your money on a muscle car or something like that. It’s that little putt-putt that gives these ’67 Beetles character, in my opinion. With that said, if the car is so far gone that restoring it to originality will require using more new parts than old, then I’m totally for having fun with it. No matter how nice reproduction parts are, they simply aren’t the “real deal.” It’s just getting harder to find these in good stock condition, so I prefer to keep them like that as long as possible. Take pride in your car! If you have to do a full restoration, or your car is in pretty rough shape, save as much (of its originality) as you possibly can. No reproduction part can perfectly replicate the original. When I first started getting into this, I was thinking of replacing everything I could with a new part just to make sure it was nice and shiny and perfect. I quickly realized, however, that it’s better to keep as much that was built onto the car as possible. Also, if you do need to find a new part, make sure that if it’s a ’67 specific piece that you find the ’67 style. A lot of these are harder to find. It would be easy to settle for a generic Bug piece, when the 1967 had some cool features that make it unique. Also, be willing to talk to others. I have a lot of people start conversations with me in parking lots, and it’s always really fun. You don’t have to talk for a long time or anything like that, but it is cool to be able to share the awesome thing that you have. These ‘67s are getting more and more rare on the roads anymore. Most importantly, have some fun! Cars are made to be driven, so be sure to drive yours. Thanks, Rees, for sharing your ’67 with 1967beetle.com. Next: Next post: Should I Purchase a ’67 Beetle? One of your best yet! Thank you for sharing such a unique story with us. Hello, Doug…Thank you for responding to 1967Beetle.com. Your participation in this website is invaluable to us all in the ’67 Beetle Community! I have to tell you that the kudos go to Rees for his careful record-keeping and colorful manner for telling the story of his Beetle. I merely did a bit of editing of the story. What a treasure to have a car owned by 4 generations of the same family! Extraordinary! And, we should all congratulate Eric Shoemaker for his ability to put together such a great site as this and to craft each article with such precision, knitting story and illustrations into spell-binding reading. I never want each edition to end! Jay, thank you for the prompt reply. I’ve told every ’67 owner I know about the site. I read daily! I’m glad you enjoy my story! When this whole process started, I could have never imagined where it would lead! 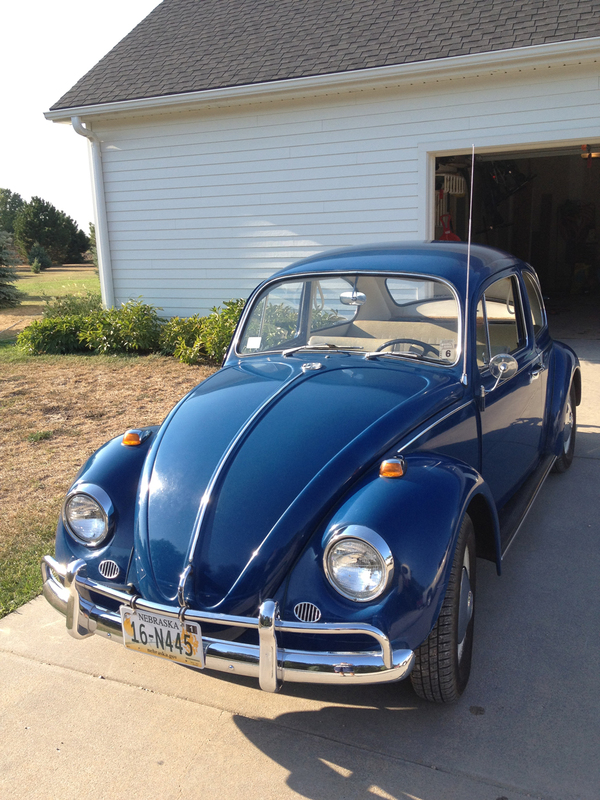 That’s the story of the last 8 years of my life; restoring my own ’67, and now creating and running 1967beetle.com. Ha! I actually wrote a research paper for an anthropology class last semester that focused on vintage Beetles and their distinct culture/value. These aren’t just cars. They’re really a way of life. Hello, Rees…I really enjoyed reading and re-reading your story. It is such a mind-boggling one–4 generations! I want to encourage you to consider not restoring your car. I believe that your ’67 may fall into the category of “survivor” vintage vehicles. The vintage vehicle crowd is pressing forward with recognizing cars which are found to be so original that they need only cleaning, tuning, measures which assure their safety on the roadways and maybe a very careful touch-up here or there. Scratches and other minor flaws are acceptable. Such cars are proving to be more valuable (or valued) than they would be in restored condition. You see, restoration changes a vehicle from what it was. No car can be restored to actual factory specifications. We do not have the same paints, for example. Another valuable point about survivor vehicles is that they are living history–we can use them as real examples of wiring, colors of bumper support tubes, etc., etc. It’s right there in front of us. That’s definitely something I think about! I really do like the car how it is, but I also know that using it as my daily driver will cause some amount of wear and tear. If I do anything, it will only be out of necessity! I love the condition, because it adds to the vintage quality. It helps to tell the story of the car’s life. It’s a really sharp color! I’m with Jay! … The imperfections are priceless and add character. Love your story and your beetle, Rees! It was one of those things where when I first started the whole process (knowing virtually nothing about cars) I thought that it would be better to get it repainted and everything right away. I’ve only recently come to realize just how important it is as a true survivor! I have an idea! I’m going to coin a new term for collector cars, “Restored Survivors”. This is when you restore a car back to it’s original condition and then drive it everyday like one would have back in the day. With a lot of care and maintenance 30 years from now you will then have a restored survivor. What do you think? Watch out Barrett And Mecum in 2043. Lol. One of the more interesting uses of the ever utilitarian “bug” was as a mine sweeper. Seeing all this love spread around for a car I grew up in is alot of fun. My grandfather, “Fireball” Wilson owned one of these and a micro bus for years. He would slide the passenger side front seat out of the bug, replace it with an enormous cooler, and off we’d go on road trips all over Georgia- usually to Savannah or Thunderbolt to go out on a shrimper for a couple of days. So you’d see this 6 foot tall teenager sitting in the back seat with an older gent driving down the highway with a cooler full of shrimp, crabs and cold beer. Never will forget that- nor the bottle of cheap bourbon he preferred to the beer. So our bug served as part time party float and part time pick up truck as well. Thanks for giving the memories some life Eric. Yours was fun to ride in as well! Great to see another Beetle being kept stock and in as original condition as possible. Great story Jay ! 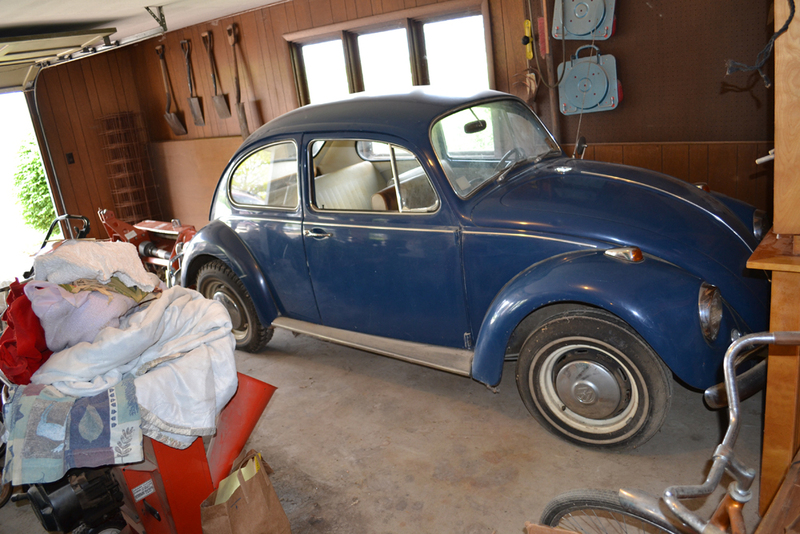 And as for Rees, congrats on deciding to keep and restore your Volkswagen Blue 1967! It sure is nice to see that young people are serious about restoring these classic vehicles to thier original condition and at the same time, realize how hard it is obtain many of these one year only parts, specially when your dealing with aftermarket products. This story along with many others that I have read and heard about, are what inspired me to purchase my 67 last year. My first car, was a 1967 an exact replica of Tim Mossmans Zenith Blue 67 with a sunroof and in the same condition. The year was 1979, I was a senior in high school in So.Cal and my Dad and his friend surprised me one day,(I gave him some money to help offset this purchase) It was my baby for several years until it got stolen and later turned up burned to the ground in order to destroy evidence! After that, I have owned a 68 Beetle,62 Beetle,and most recently, a 63 and 60 Beetle not to mention our 2008 Jetta and 2011 Jetta ! So I know exactly how you felt when you said: “I can never sell this vehicle!” Happy motoring, Jaime. Thanks for so much interest in Rees’s article. I promise to keep finding more of these great cars and showcasing their unique stories! 1967beetle.com brings me a lot of joy to curate and manage. You are all part of the success! People are always shocked when they find out how much I care about this car. This definitely is not the typical college student’s car, and I am proud that I can care for this and preserve it for years to come! We respect you! I’m 33. I did not care about my Grandpa’s VW until about 8 years ago. You caught “The Bug” early. Yes Rees… Drive it all you can. I’m a believer in driving them. If you can’t take them out and enjoy them, they become high maintenance art pieces. Wonderfully story to go with your car as well. Gives a whole added pride to owning, and reviving the car. I agree with you 100%! Aside from the winter, when we salt our roads, this is my daily driver.